Based on the novel by Fyodor Dostoevsky, Hakuchi (The Idiot) is the story of a man who returns from Okinawa following a stint at an asylum where he contends with another man for the affections of a beautiful woman. Directed and edited by Akira Kurosawa and screenplay by Kurosawa and Eijiro Hisaita, the film is an exploration into a man entering modern society following a period of war as he struggles with his new surroundings. Starring Toshiro Mifune, Setsuko Hara, Masayuki Mori, Yoshiko Kuga, Eijiro Yanagi, Chieko Higashiyama, and Takashi Shimura. Hakuchi is a compelling yet flawed film from Akira Kurosawa. The film revolves a mentally-ill young man with a condition that allows him to say imbecilic things where he falls for a beautiful woman only contend with other men for her affections. It’s a film that plays into a man who exudes a sense of innocence as he is entranced by this woman but also gets the attention of another young woman who is intrigued by him. Even as he would rouse up the emotions of some who are aghast over the things he says as well as his actions though he doesn’t mean to do anything wrong. Yet, part of his strange actions is due to his own illness where he would go into an epileptic fit in case things get intense for him. It would play into a man who finds himself in the middle of something as he is in love with two women but is dealing with the presence of other men. The film’s screenplay would play into the life of Kinji Kameda (Masayuki Mori) who has just been released from a mental hospital following his service in the war as he copes with his illness and what to do with his life where he would meet another former soldier in Denkichi Akama (Toshiro Mifune) who is also a man of great wealth. Yet, they come across the picture of a beautiful woman named Taeko Nasu (Setsuko Hara) as Akama knows her and wants to marry her. Yet, she is having an affair with another man whom is attached to Ayako (Yoshiko Kuga) whom Kameda is fascinated with. Thus, things become complicated as there is a lot that happens but things get messy and all of these things of who Kameda should be with would make the story meander at times. Yet, there is a reason as it’s really a truncated version where there’s more that is out there in the story but the result would only be a teaser of who some of these people are. Akira Kurosawa’s direction is very intriguing for the way he captures a simple drama told in the span of an entire season where it’s all about attachments and what people want where this young imbecile is caught in the middle of this drama. Much of it is told in a very intimate manner with a lot of close-ups, medium shots, and some wide-shots for large crowd scenes that includes a birthday party for Taeko where Kameda would tell her a story as it becomes very dramatic. Even as Kurosawa would create these scenes and moments that do play into a sense of longing or anguish that is looming with Kameda either being used as an excuse or the one who precipitated these actions. While there are scenes that are quite long and has elements of suspense and tension in the drama. It’s a film where there is a lot more to be said but there’s elements that keep it from being far more interesting. Serving as the film’s editor, Kurosawa would create some stylish cuts including some transition wipes but there are elements where the transition wipes become jarring and there’s moments in the film where it meanders in its pacing. With the aid of editor T. Saito, the film which had an original running time of 265 minutes was re-cut by Shochiku studios into a 166-minute running time against Kurosawa’s wishes. As a result, the truncated version not only features a lot of flaws in the story but also raises question into some of the back stories of the characters in the film. Overall, Kurosawa creates a solid yet flawed drama about an idiot who touches the hearts of the people he meets in his life. Cinematographer Toshio Ubukata does excellent work with the film‘s black-and-white photography as it plays into the snowy look of suburban Tokyo and other places where the lighting is key to scenes set in Akama‘s home. Art director So Matsuyama, with set decorators Genzo Komiya, Shohei Sekine, and Ushitaro Shimada, does fantastic work with the look of the homes that Kameda would live in including the inn run by the family he‘s staying at and the shabby home of Akama. The sound work of Yoshisaburo Imo does nice work with the sound to play to some of the parties and places the characters go to. The film’s music by Fumio Hayasaka is superb for its orchestral-based pieces that play into the drama and some of the light-hearted moments including a couple of classical pieces that are used in the film. The film’s amazing cast include some notable small roles from Noriko Sengoku as Ayako’s cynical sister Takako, Eijiro Yanagi as the friend of Ayako’s father, Chieko Higashiyama as Ayako’s mother, Minoru Chiaki as Taeko’s lover Kayama who is revealed to be a coward, and Takashi Shimura in a superb performance as Ayako’s father Ono who takes Ameda into his home as he reveals the fortune that Ameda has. Yoshiko Kuga is excellent as Ayako as a young woman who represents the sense of innocence but also realism as someone who has experienced a lot yet has a hard time opening to the goodness that Kameda offers. 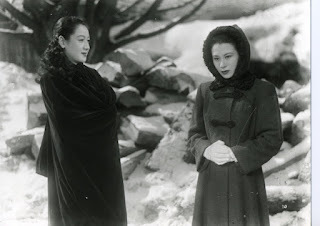 Setsuko Hara is fantastic as Takeo as this beautiful but troubled woman who is amazed by Kameda’s own kindness and flaws as she becomes tormented and possessive about Kameda as she would quarrel with Ayako over him. Toshiro Mifune is brilliant as Akama as this man served the war and has acquired some money as he finds himself competing against Kameda over Takeo’s affections yet deals with the anguish over hurting someone who is actually a good person. Finally, there’s Masayuki Mori in a phenomenal performance as Kinji Kameda as this mentally-ill man with a strange ailment who exudes a sense of innocence and strange wisdom as he tries to get people to see things in a different light though he would unknowingly cause trouble as it’s a very mesmerizing performance from Mori. Hakuchi is a stellar yet flawed film from Akira Kurosawa. Despite amazing performances from Masayuki Mori, Toshiro Mifune, Setsuko Hara, and Yoshiko Kuga, it is a film that has a lot of ideas and themes that play into the goodness of humanity in a troubled post-war setting. Due to the fact that its original 265-minute cut will never see the light of day and the truncated version of this film is the only one that is available. It’s a film that reveals what could’ve been if Kurosawa had complete control as it’s only a glimpse of what he would do to Dostoevsky’s famed novel. In the end, Hakuchi is a terrific but underwhelming film from Akira Kurosawa.